Bio: I'm a hard working 16 yr. old that wants the best for myself and my teammates. I work hard in the classroom to be a leader on and off the field. I'm a leader to my classmates and teammates that push them to be the best they can be, as well as myself. Without a great education I wouldn't be able to achieve my goals on the field. At 6'4, 300lbs, Noah Herington stands a giant among most other football players, the massive senior lineman from Bath Haverling high school (Bath, NY) is still pondering his future. After being nominated to the 2015 NYS All-State 1st Team, Herington was invited to participate in the 2015 Blue Grey All-American Game in Tampa, FL on January 10th, 2015. However, the senior lineman is still deciding what's next? "All the accomplishments are good, but what is frustrating me, is even with starting over a lineman with multiple offers and committed to Virginia Tech in the All-American Game, I still don't have any solid D1 offers," says Herington. "I know Bath is a tiny town to the rest of the world, but I've done a lot of traveling this past year to increase my exposure, and it still seems colleges skip over this area." "Maybe the only other option is Prep School, I've visited a couple, and currently speaking with Lawrence Academy to discuss a visit soon." 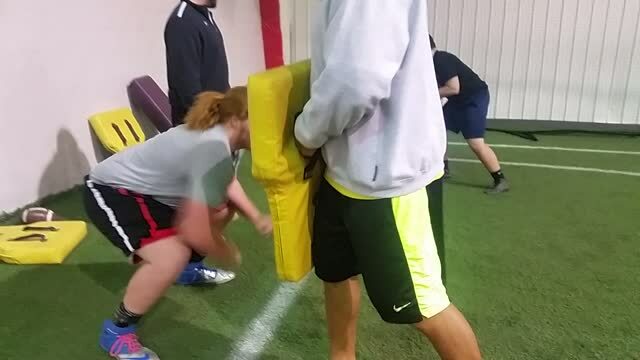 Mentor and former NFL lineman Scott Virkus (Colts, Patriots, Bills) has spent time working with Herington at the NLB Lineman Academy in Rochester, NY on Sundays to help prepare for college. "I just cannot believe a kid goes to an All-American game, is chosen by the coaches there to start over top talent and nobody notices, this kid can play D1 and within 2 years will be starting for anybody," explains Virkus. "I know lineman talent when I see it, and Herington is one of the best I've seen from around here in years, I'm going to continue to work with him a bunch between now and summer, but I am very disappointed, this is the kind of strong country lineman most defenders would not wanna face back in my day, he would absolutely start for a school like Syracuse, but could honestly play for a Michigan, Ohio State, Notre Dame or Penn State," says the former NFL Defensive End. Herington was offered a walk-on opportunity at Rutgers, but as signing day approaches is still weighing all options.